Traveling with The Outreach Foundation on these ministry experiences as I have for the last seven years, I have learned many things. One of them is that you are part of a team, and even though we begin as strangers, very quickly we bond into a family knowing we have a common Father. Tonight we had the privilege of coming into deeper community with each other as we reflected on the day. Pam Hillis of First Presbyterian Tulsa led our devotion around Romans 12:9-16. In my travel NRSV Bible, the heading says, “Marks of the True Christian.” To paraphrase, we share our gifts, we lift each other in faith, we love and we serve. Those marks should reflect our lives in Christ, marked for us on his head, hands, feet and in his side. This is our model, and today we experienced those same marks on those we came to be with. The focus of our day was Our Lady Dispensary (OLD) in Beirut, a ministry founded in the days of the Lebanese Civil War (1975-1990). In a small second-floor office in a poor area of Beirut, fifty years worth of war refugees have found their way to Christ’s hands and feet in action. For the past seventeen years it has been lovingly and excellently run by Grace Boustani, a Lebanese social worker and sister in Christ. With limited resources, limited even more by donor fatigue due to the length of the conflicts in Iraq and Syria, she serves some 500 families looking for help with food, medicine, rent and trauma healing. 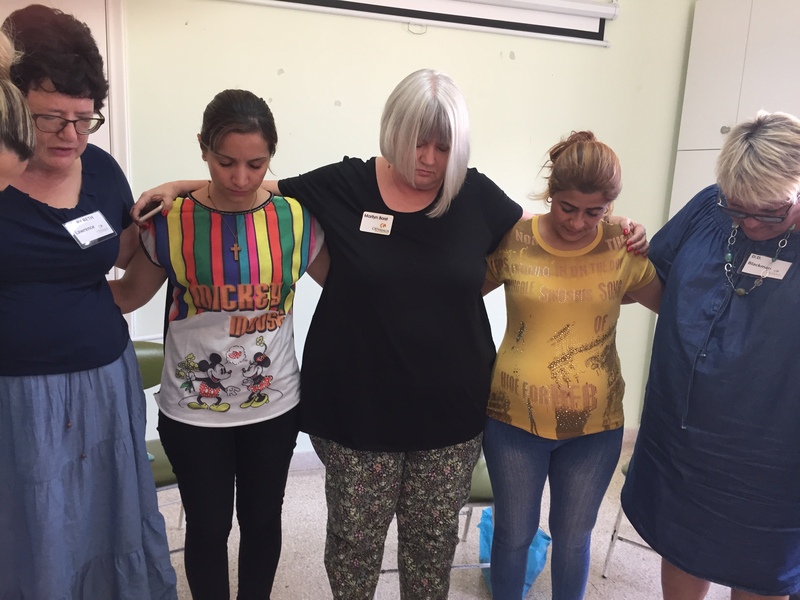 Our team of nine women gathered in a circle with Grace and Rola, who has been trained to lead trauma healing workshops with a Bible Society curriculum revised for the Middle East context. We heard of children in a pilot week-long camp who arrived on a Monday with no smiles, no words and no hope, and left on Friday as engaged young people, speaking, playing and using their own hands to draw pictures to share their stories. We met two young women, one Iraqi, one Syrian, each the mother of three, each having experienced the flight-in-the-night story that is so common among refugee families. It is cruel and heartbreaking, and yet here at Our Lady Dispensary these two young women opened up to share with us. And in their stories is where I find Pam’s scripture so perfectly reflected today. Even in the brokenness of lives torn apart by loss and war, these two were in our midst sharing their gifts, lifting us in faith by their acts of love and service. Sweet R. from Iraq was pregnant with her third child when forced to flee in the night with but a half-hour’s warning as ISIS moved in. Four days later in the temporary sanctuary of her church, she gave birth to her son, now two years old. Coming to Lebanon, her family found OLD and received some help. 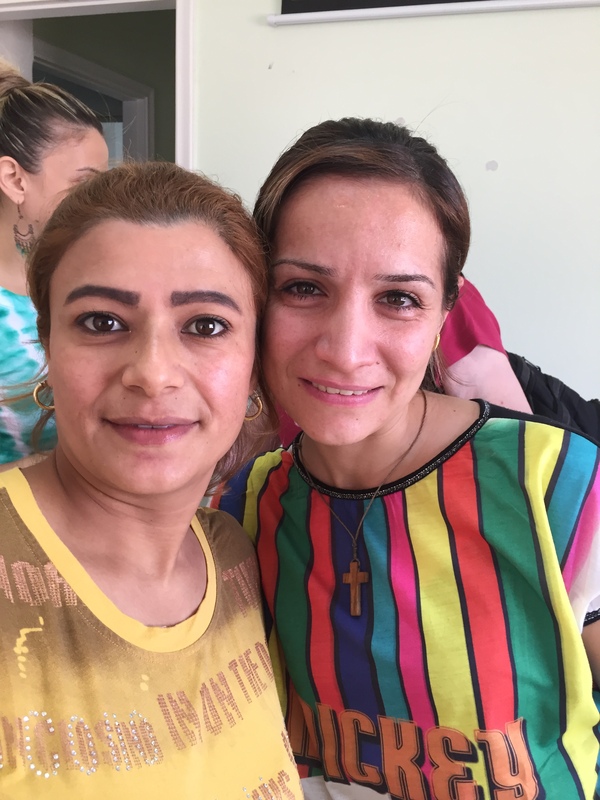 Not just willing to receive, she has since become Grace’s chief volunteer for the Iraqi refugees served by OLD, serving as a liaison for the families and OLD. She does whatever she can around the office to help, including making coffee and cleaning. How is it possible for this sweet young traumatized mom and wife to be able to serve out of her situation? A woman just waiting for hope whose prayer is “God, just open a door for us”? The answer we experienced is that she is marked: she uses her gifts, her faith lifts those around her, she loves and she serves. Our new friend Y. is from Syria with another story of loss. So much loss for such young women! High rents. Menial labor for a husband if he can find it. How do you cope? And yet, when she made her way to the OLD neighborhood and Grace’s outstretched hands she found something different than she had ever known. In her words, “The day I started to know God, I started to hope and everything changed.” Y. met Jesus and came to know him through reading God’s word, going to church, and is now a Christian. Her husband has also accepted Christ. One day when she returns to angry parents in Syria who do not want to accept this she will repeat what she has already told them: “Open the Bible and you will see the truth.” She is marked, and having shared those marks with her husband, will one day share them with the rest of her family. As we reflected on the lives of these two young women tonight, Pam’s devotion brought us all back to the same place: we are the Body of Christ, and that body is marked. May those marks be seen in us all and shine God’s glory as brightly as the marks on Grace, R. and Y.